Israeli scientists pursue a cancer breakthrough by studying the unlikeliest of creatures — the subterranean blind mole rat. The molecular secrets of the rodent’s cancer resistance could offer new ways to treat one of the world’s leading killers. Subterranean blind mole rats are remarkable creatures. These sightless rodents spend their entire lives in poorly ventilated, underground tunnels, thriving where oxygen levels can fall to one-third the level at Mount Everest’s summit. Evolving in such extreme conditions has bestowed a number of uncanny traits on these creatures. They can live longer than 20 years — a life expectancy that’s about five times that of their evolutionary closest kin, mice and rats — while hardly showing signs of aging. Perhaps more remarkable is the rodent’s extraordinary resistance to cancer, a disease that afflicts all animals and vies with heart disease as the leading cause of death for humans globally. Naturally occurring cancer has never been observed in blind mole rats. An experiment to induce cancer with chemical carcinogens led to tumors in all mice and rats, while blind mole rats rarely developed the disease. In human beings, on the other hand, 20 million new cancer diagnoses are expected annually within the next decade. Might the blind mole rat hold the key to a cure? A group of scientists, led by Aaron Avivi, Imad Shams, and Irena Manov at the Institute of Evolution of the University of Haifa in Israel, are on the road to answering that question. The team’s promising research efforts are aimed at identifying how blind mole rats evade cancer — and what lessons this might hold for treating humans. 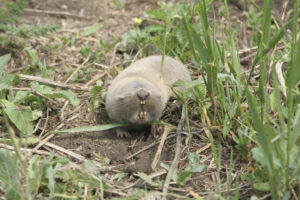 The Haifa University team has focused on specific cells, known as fibroblasts, in the blind mole rats’ connective tissue. When cultured in the lab, these cells (along with their cellular byproducts) halt the growth of cancerous cells introduced into the culture media, including several cancers that affect humans. The team aims to identify the compounds secreted by blind mole rats’ fibroblast cells that exhibit strong anti-cancer properties — a difficult task since cells create and secrete thousands of substances. The search has narrowed to about a dozen proteins. Researchers theorize that blind mole rats rely on these substances to mitigate the tissue damage that occurs in metabolically stressful, low-oxygen conditions. Normally, oxygen-starved cells commit a form of cellular suicide. Blind mole rats’ cells, however, persevere while also benefitting from well-honed, cellular repair mechanisms that contribute to the rodents’ resistance to cancer and aging. Preliminary results indicate that a biochemical process stops the division of cancer cells upon interaction with the blind mole rats’ fibroblast cells. Cancer is a disease in which cells divide uncontrollably, forming tumors — so switching off this ability should effectively halt cancer’s progress. Based on these encouraging findings, and with the help of investors, the leading researchers at Haifa University have formed a company to raise additional funding to take the research further. The researchers will continue using a variety of experimental approaches to isolate suspected cancer-blocking substances and learn when they emerge in a fibroblast cell’s maturation. The group will also investigate how the agents interact with and disrupt human cancer cells. If pharmaceutical firms can develop successful interventions based on this research, the scourge of cancer in human beings could conceivably be brought to a halt—thanks to insights from an unlikely, sightless source.